Less than half a day to Rambouillet Semi-Marathon . Silviu and I have finished the Surcompensation (“Overcompensation” in English), our last run before D-Day. We did a relatively, easy-paced 5.5km run, interspersed with 6 sets of 20s sprints, with 30s of recovery between sets. I have never heard of “Surpcompensation” (translated as “Overcompensation”) until I came to France. Well, it’s not that I am a seasoned runner. Perhaps it’s frequently used in the English speaking world of road runners, which I never was before coming to France. I do not really understand the theory behind. Surcompensation is usually done a day before the race. The few days before Surcompensation should be just a few easy runs, after a last intense workout. This pre-race will supposedly fire the impulses of the leg muscles so that the legs would be in optimal race mode the following day. 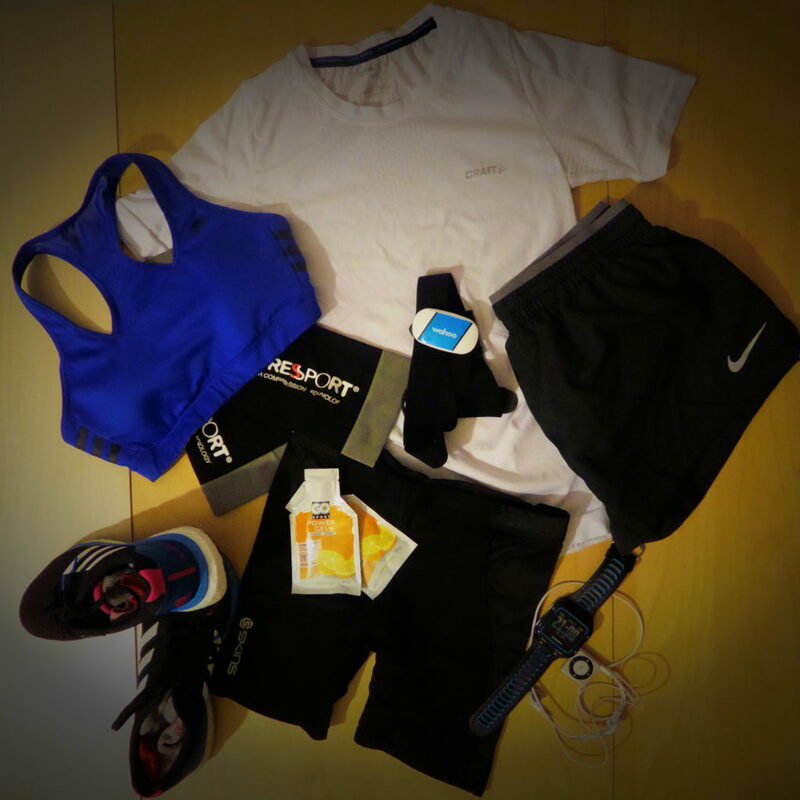 Race Gear – Am I Ready? Next step is our race gear preparation. Doing a road race is much simpler than a trail race. In a road race (for distances up till a marathon), the most important gear is the outfit you run in. For me, it’s pretty standard : a pair of shorts, a t-shirt, and my favourite racing shoes, my faithful Garmin watch, a heart rate monitor and 2 packets of energy gels. The gear is neatly laid out so that I can have easy access to them tomorrow early morning. In a trail race, it’s an entire different world : race pack, water bags or bottles or both, energy gels/nuts/chocolate – anything that helps to get you going for hours, apparel for all sorts of weather (windbreaker, rain jacket, long sleeved shirts and pants, change of socks etc). Do you listen to music while running? What kind of music do you listen? I sometimes listen to music when I run, especially during long runs to ease the monotony of right leg forward, left leg forward, right leg forward… However, I always listen to music when I race. The Ipod shuffle has seen me through many, many races. No exception for this time. My Ipod is filled with 2 hours of high-tempo songs. (Hopefully, I would finish in much lesser time). Frankly speaking, I don’t think I pay much attention to the music during the race. The music does not seem to distract me much from my suffering. However, I do need the music at the start and the near-end of the race. At the start, I need music to get myself into the “battle mood”. Music is like a kind of drug, a shot of caffeine. It reduces my tension at the start time. It fills me with adrenaline, propels me for the first few kilometres until I get my rythme. At the end, I would turn up the music, and try to match my pace with the high-tempo songs. It’s like another shot of caffeine to last me to the finishing line. Last, but not least : Sleep. It’s always hard to sleep before a sleep, especially when you are not used to sleeping before midnight. Silviu and I have decided to get into the bed by 10pm, so that we, hopefully, can have at least 6 hours of good sleep. (It’s wishful thinking that we will fall immediately to sleep at 10pm).